Are you facing problems of frequent maintenance or breakdown with your equipment. Is rust and corrosion eating away your valuable machinery. 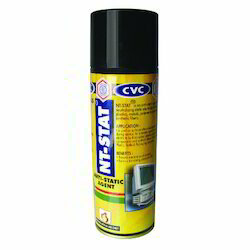 We now have instant solutions with CVC industrial aerosols. prevent breakdowns caused by dirt, dust, rust, corrosion, short-circuit, voltage surging, etc. . By regularly cleaning, derusting, lubricating, polishing, insulating & protecting from corrosion with CVC products for instant maintenance. Packaging Size 100-ml & 550-ml. Aerosol Tin 5-litre Carboy. It is a Dielectric, Anti-tracking, Protective Coating specifically formulated to provide an instantaneous, clear, dry, protective coating for PCBs to protect from moisture, corrosion, tracking, dirt & dust, fungus & pollution. It is a solder-through type of coating based on modified acrylate, for easy repairs. It is scratch-proof after it dries and provides easy handling & stacking during transportation. It assures long life to components & PCBs against adverse conditions. It conforms to MIL-I-46058C specification. It is approved by Centre for Development of Telematics (C-DOT) and (CACT). It is also RoHS compliant and environment friendly. Visible under U/V light for easy identification! It is approved by DGCA for aircraft application. Method Of Application: (For Spray) By holding 15-20 cms. away from printed circuit board, it should be sprayed in to and fro manner, so that uniform coating is obtained. This coating should be allowed to dry before handling the PCB. The coating should touch dry in 10 minutes. 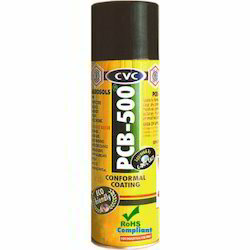 (For Bulk) The PCB’s may be brushed or dipped in the solution of PCB-500(Black) for 5 minutes and allow to dry for 15-20 minutes(touch dry). Packaging Size 100-ml., 250-ml. and 500-ml. Aerosol Tin. It is based on family of solvents which are chemically and thermally stable, low in toxicity. It can be safely applied to a variety of materials including metals, plastics, rubbers, ceramics and coatings. It has got good electrical properties and excellent cleaning and penetrating properties which makes it suitable for cleaning electronic instruments. It is approved by DGCA for aircraft application. Applications:Computer controls, fine and delicate instruments, Magnetic Tapes and heads, Precision valves and components, Oxygen and Hydraulic systems, Semi conductors, Printed circuit Boards and Disposable medical devices. Does not effect Plastic or Rubber surface. Packing:100-ml., 250-ml. and 500-ml. Aerosol Tin. CVC ARMCLEAN is a non-flammable, demoisturizing, carbon removing and safe cleaning agent with low toxicity and high solvent power. It can be used on up to 33KV high tension lines. AREA OF APPLICATIONS:It is used for cleaning Electric Motor Windings ‘HT & LT Type’, all other Electrical & electronic contacts and components ONLINE without switching off the equipment & degreasing machinery & equipment’s as a result it enhances the performance and reliability of the components. It is a diluent for a variety of formulations such as adhesives, lacquers & paints, mould dressings, metal working lubricants etc. Restores electrical continuity on all types of contacts & controls. 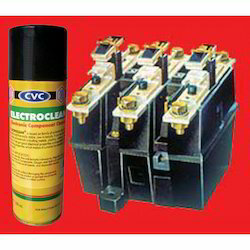 Removes grease, dirt, oil & oxidation from Electric Motor windings, all other Electrical & electronic components. An Anti-static agent for neutralizing static electricity built up on rubber,plastics, metals, polymeric components and synthetic fibers. AREA OF APPLICATIONS:It is used on surfaces where electrostatic charge is built up during service for neutralizing static electricity built on rubber plastics, metals, polymeric components and synthetic fibers, Electronic, Electrical, Plastic, Textile & Packaging industries to prevent settling of dust & dirts. Forms a fast drying, conductive film. Reduces dust build-up on surfaces. Packaging Size (ex. 1L or 1Kg) 100-ml. & 250-ml. Aerosol Tin. It is an Anti-tracking Dielectric Sealant for terminals to provide instant insulation. When sprayed, it leaves a thin, hard transparent, dielectric, water repellant and protective film on any surface of electronic components. It is available in different colours such as Red, Green, Blue etc. PCBs and Electrical and Electronic parts, Ignition systems. Induction Coils, EHT Tranformers and windings terminal blocks, Cables, Connections, Aerials Switch-gear junction boxes and Starter Terminals, Battery Terminals, Insulators, Bushings etc. Protects from sulphation for a longer period. Improves contact Efficiency. 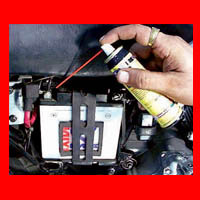 Approved and recommended for EXIDE Battery. 100-ml. & 250-ml. Aerosol Tin. To reduce high thermal impedance of air gops between the mounting surfaces of the semiconductor devices and heat sink. This white compound has good dielectric strength and will not harden, dry out or melt even after 1000 hrs @ 200°C. 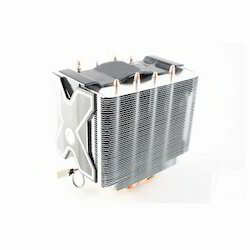 It is used for semiconductor devices and heat sinks, power resistors and chassis, and any two parts which must be coupled thermally. Looking for Breakthrough in Maintenance ?